Welcome to Day 4 in the StencilGirl Products and Craft Hoarders Anonymous Blog Hop! Craft Hoarder...me???? NO way! I'd rather say I am a Craft COLLECTOR of fine things. Yes, it is true, I have a "few" supplies. I took pictures to show you, but after reviewing, I have decided to save that for another day when I am a little braver. Let's just put it this way 15+ years of scrapbooking, card making, mixed media, crochet, embroidery, the list goes on and on........I think you get the picture. So, on to today. The challenge to get messy is not that much of a stress for me. I have NO problem with that. As a matter of fact, I think I will be rockin alcohol ink nail polish for quite some time after this project! I made it my goal to get rid of something I don't use anymore and make it something I do use. I decided on alcohol inks, alcohol ink pads, photo paper (just some cheap old stuff) and kraft glassine paper which didn't make its way into this project in the end but you will see it in a future post. **Disclaimer here: I ended up working with alcohol inks for FOUR hours straight determined to use EVERY last drop of what I had. I tried tons of different things and this one here is the last thing I tried. Alcohol inks...never been quite a fan, but I did manage to buy EVERY color--well OF COURSE I did. I took a piece of 8.5" x 11" photo paper, used an applicator and applied the ink as well as just using it out of the bottle. After I was done, I laid four of my new Doodle It designs from StencilGirl onto of the ink. Doodle It Blossom, Doodle It Layered Petals, Doodle It Daisy and Doodle It Rose. It was basically dry at this point. I then took orange, pink, red and yellow and dripped them into the stencil. Amazingly enough, the stencil held the ink in, it was pretty fun to watch. I left the stencil in place while it dried, maybe 5 minutes total. Then....I lifted the stencil which gave me a wonderful reverse technique. and the final results......in case you were wondering, YES!!!! I used every last drop of 20 bottles of alcohol ink in my four hour play. GONE! YAY!! If you liked what you saw, I would love if you would follow me on Bloglovin. If you haven't visited the rest of the blogs on the hop today, you can find the list below. Remember to leave a comment to be entered into the GIVEAWAY on StencilGirl Talk. Maria McGuire You are HERE. Wahouuuuu! I don't like alcohol inks but your result is really tremendous! This is SO GORGEOUS, and your tutorial is so easy to follow! Love your goal to get rid of something not uses anymore and make it something to use! This is pretty cool! I like what happened around the edges of the stencil and am anxious to give it a whirl. Thanks for this great post! What wonderful colors. I bought some alcohol inks...because I had to have them..but never used them at all. Photo paper, huh! I have a LOT of that too. 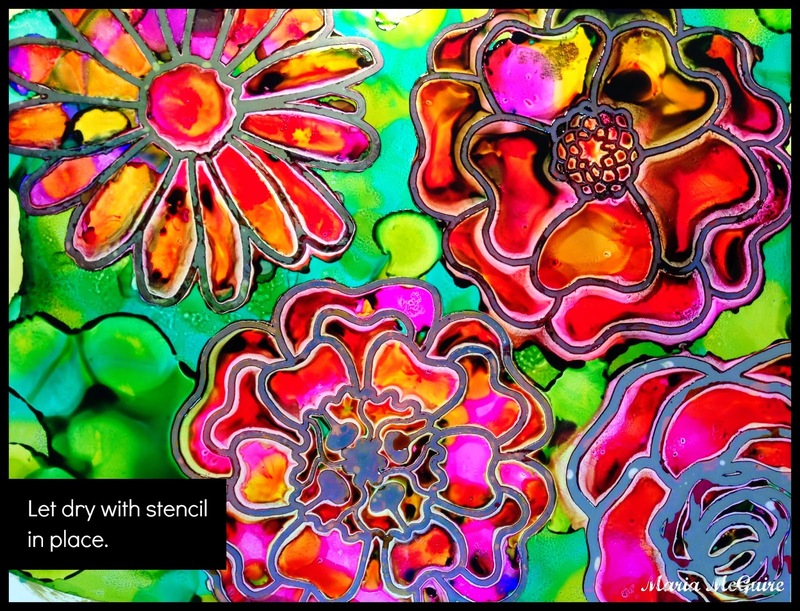 Incredible use of alcohol inks!!! You did a magnificent job using these stencils and thanks for the wonderful tutorial with these easy steps and inspired me!!! Love this. The colors are bright and bold. I have to try this. I have the inks but never think of layering them. thanks for the idea. I am seriously blown away by what you did here. My stash of AI is in NY unfortunately but they will come back with me next time. Love the colors...everything! WOW. The colors are AMAZING! I am so pulling out my AI's from the back of the closet and using them up. Thanks for sharing and hopping with us. stunning, amazing colors and technique. what an awesome project!! What a fantastic idea. I love the way your project turned out. Not sure why you don't like alcohol inks, Maria. 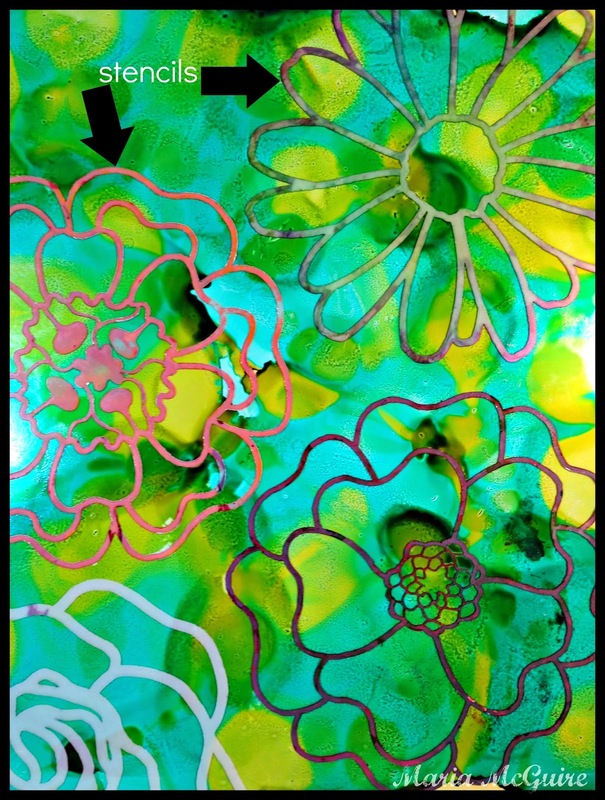 Your photo-paper flowers (using the doodle stencils) turned out so beautiful! I'm a little obsessed with alcohol inks, spray inks, and spray paints right now but I haven't tried them much with stencils yet....but I will now! Fantoostic. The vibrancy of this piece blows me away. Those stencils.. oh my. I love these bold, summery colors. The first photo made me think of being a kid...laying under a tree and looking up at the summer sky....the perfect view! Thanks for hopping with us at Craft Hoarders Anonymous! Oh Maria, leave TT to you to come up with such a fabulous idea. I love it and have the stencils too. This is so fun! When do we see the other pieces in your play? Beautiful, love that technique! Thanks for joining us at Craft Hoarders Anonymous! Such much color and magic to be found here!! Holy Stacks of Craft Supplies, Batman!!!! You used up the rest of 20....read it.....TWENTY bottles of alcohol ink???? Unbelievable. But what a gorgeous thing you made! I just last week started playing with photo paper and water-based inks. Total disaster. Ha! But I am finding ways to pull it out of the trash bin. :) Thanks for sharing with us!!!! 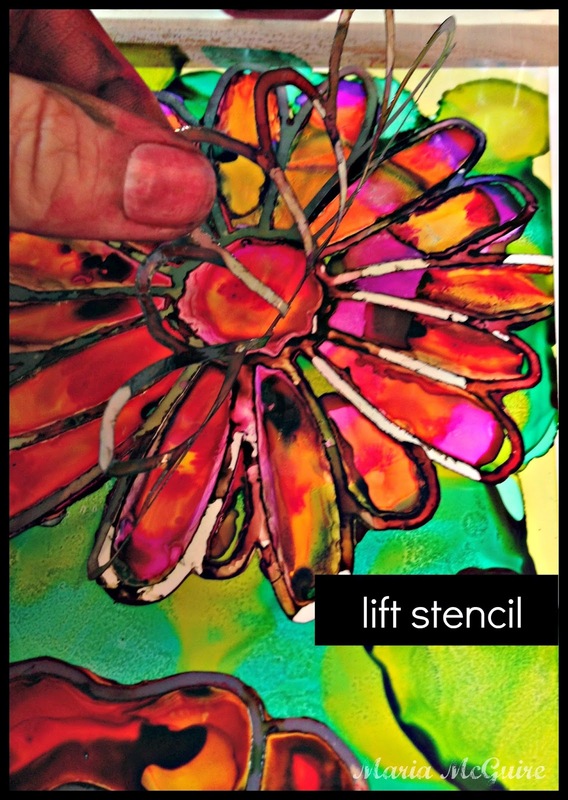 The alcohol inks gave a cool effect with the flower stencil patterns. Sounds like you had a good time playing! I'm one of those that has to have every color too... haha. 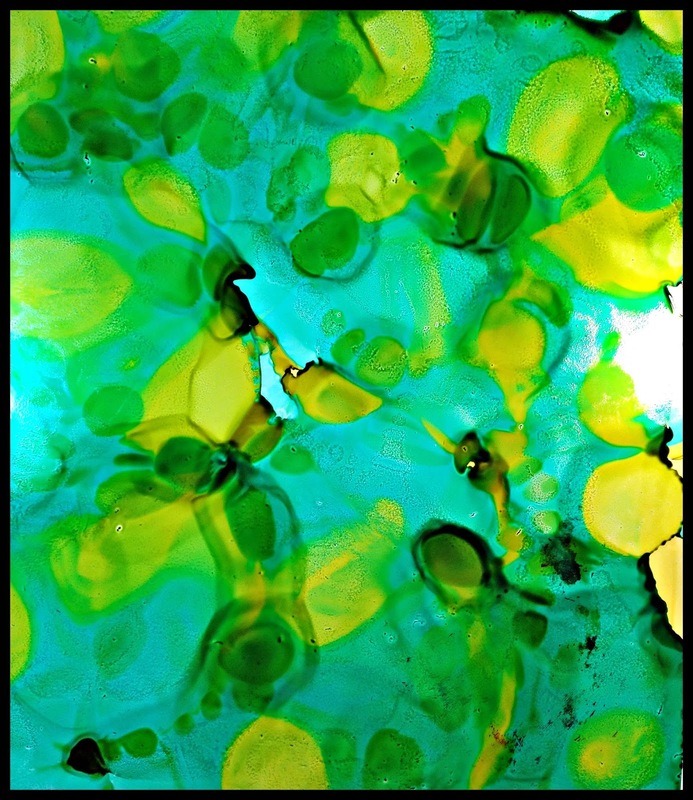 I will definitely get the alcohol inks out to play now. Wow, Maria this is awesome. 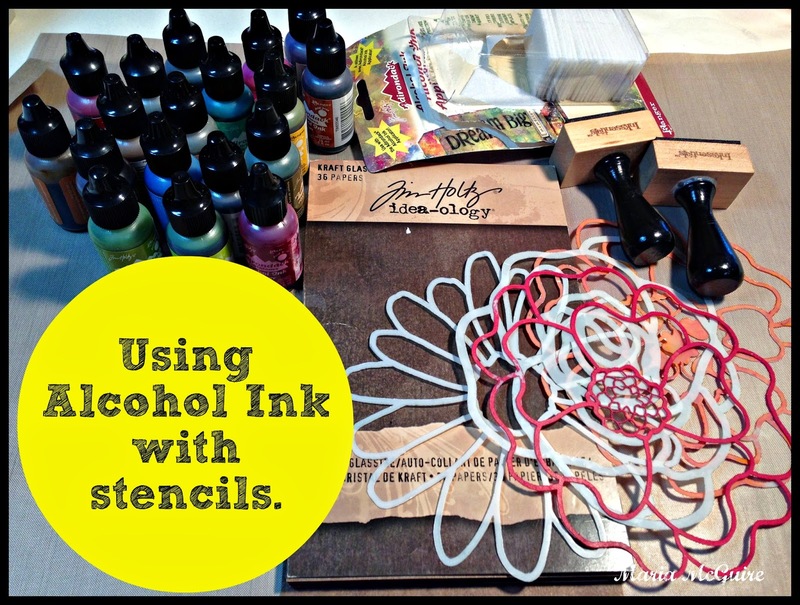 I must try this, because I have too many bottles of alcohol ink gathering dust on the shelf. So nice to see the steps as you created. This takes my breath away! It has the beauty, brightness and luster of church windows made from glass that was colored the old-fashioned way (with minerals melted into the glass) that creates such depth and richness of color. Your idea to use stencils in this way is brilliant! Great technique, Maria. I too have many alcohol inks that I never use. Not sure why, however. Will have to first purchase all your doodle flowers and try the technique. Love the colors! Thanks. Wow love those colors. It turned out amazing! Thanks for the inspiration! Super cool technique, love the brilliant colors and the flowers are amazing. Brilliant!! Now aren't you tempted to go get some new inks?! This is so pretty! I love how you created the flowers. Ooohhh...I think I have some alcohol inks hanging around here somewhere! Gorgeous results! This came out so beautifully!! Love the flowers and how it looks almost like a stainglass piece! Gorgeous! Absolutely incredibly beautiful! The colors are amazing. I love it. This is sooooo pretty! I love how it turned out...it looks like stained glass! Beautiful! 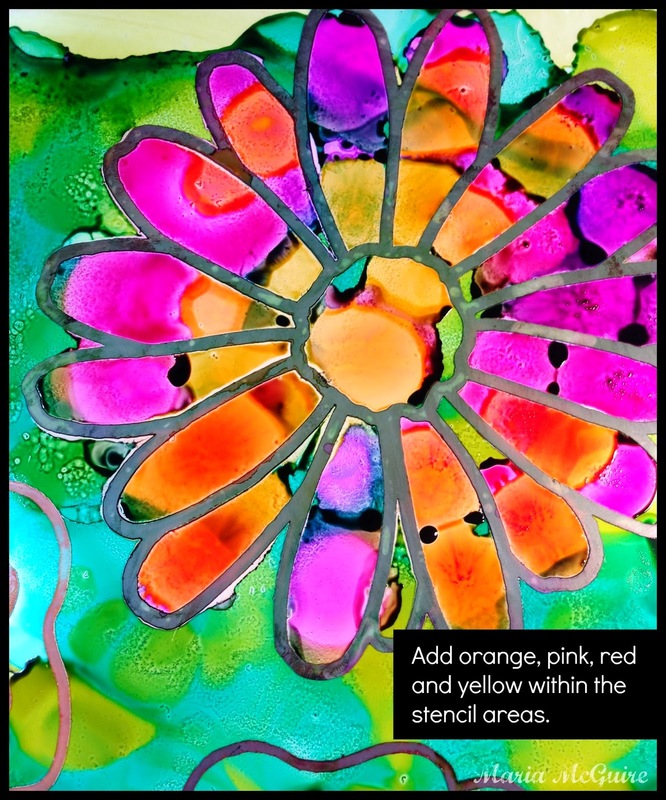 I never know how to use my alcohol inks ~ I think I will try this! I also have some bottles of alcohol ink which I hardly ever used, but like what you did and will probably give this a try. I love what you did with the stencils. Yes!! I have some Alcohol Inks but always find them to dark - now I know how to use 'em up. LOVE the result you got. Love the vibrancy and those stencils. Gorgeous result. Ohh my godness, this is amazing, thanks for this fantastic tutorial!!!! Beautiful -- looks like some alcohol ink projects are in my future. Scary to think what color your hands were when you finished! hee hee This is wild! I love all the variation in the color and pattern! Thanks for being part of the Craft Hoarders Anonymous Blog Hop! Oh my GOSH!! This is fantastic and it has my mind spinning in a million different directions. THANK YOU for sharing. I'll be sending people this way to check it out for sure. Love it! Love your flowers. Your tutorial is one of my favorites. Now I know what to do with my inks. Thank you so much. i don't want this hop to end!!!!!!!!!! Fabulous. Really looks like stained glass! Add me to your admirers of this new idea with alcohol inks...luv it. This is wild. . .as in wildly beautiful!! 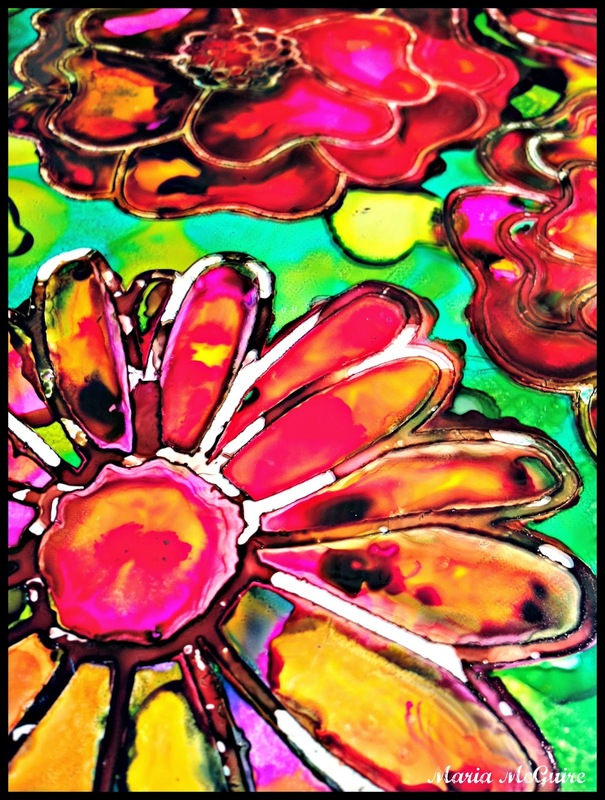 Love those psychedelic flowers. . .you may not be enamored with the alcohol inks, but you certainly have mastered them!! Love this! Maria!! Hi :) I absolutely love what you've created using basic supplies and simple techniques. Your tutorial was very easy to follow. I will definitely try my hand at this! Thanks a bunch, dear girl! I love alcohol inks! This project is so cool. I just received my order of doodle stencils...gonna get a couple more. PLEASE make more open style stencil designs like these as they're awesome!